Will playing with his robot arm after completing the project. I’m pretty impressed with Will. Yesterday we went shopping – no going shopping isn’t impressive. While at the mall, we wandered into the education store. 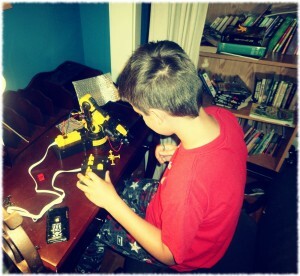 He found a robot arm kit in the store for $60. After thinking about it for a while, he decided that he wanted the robot and wanted to spend the day building it. He used his entire allowance savings to purchase the kit. It took him over six hours to build it. I had to help solder a couple of broken wires for him, but for the most part, he did the work. Later in the evening, when he lost pieces, he didn’t get frustrated. He came downstairs and waited until I was finished with what I was doing and then asked for help. That isn’t always the case when kids get stuck in a big project. It is an even bigger accomplishment for a kid with ADHD (and even more so on a medication break day). Good job Will! I certainly didn’t get as much accomplished yesterday as you did.